"Antenna Source concept - the new approach to antenna design"
History of the AToM project goes back to 1999 when development of Characteristic mode solver at the Department of Electromagnetic Field at CTU has started. Since then, those MATLAB codes are constantly updated and cover not only Method of Moments and modal decomposition, but involve number of tools for complete characterization of radiator and powerful optimizer. Click for additional information on AToM. What is the Source concept? 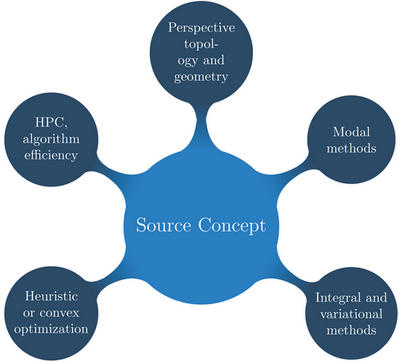 The Source concept is generalized approach used to effectively evaluate and optimize antenna parameters using solely antenna geometry and source currents. Furthermore, the source current may be decomposed both modally (in terms of characteristic modes) and even spatially. Briefly, given any antenna, the Source concept can predict which mode or which part of the structure contribute to radiation, stored energy or losses. Since we are using modes (eigenstates), at this point the analysis does not consider any feeding. Excitation of the antenna is employed at final stage of design and the contribution of different modes to the total state can be easily controlled. In glance, the concept is symbiosis of several fields depicted at the following figure. Recently it has been shown  that for small antennas the stored energies and radiated power can be expressed using only the surface currents and not the field in entire space. Since energies of radiating system in frequency domain are by definition infinite, we propose so-called measurable (or observable) modified energies, which are unique and finite . Given set of characteristic currents, modal energies and radiated powers can be evaluated separately so contribution of different modes to stored energy can be easily identified. The animation below presents analysis of dipole antenna with three modes considered. Electric and magnetic energy are depicted by blue and red bar and indeed, when they are equal, the given mode is at resonance. See  for more technical details and actual implementation of the energy and power superposition. An effective technique for modal radiation efficiency calculation based on decomposition into characteristic modes has been recently developed in  and . Having modal efficiencies in hand, which are by definition does not depend on excitation, one is able to evaluate total radiation efficiency when the modes are physically excited. Again, contribution of different modes to losses is readily seen and optimization may be used to change antenna geometry or modify position of feeding. Recent research [6-8] resulted in finding operators and techniques which give current that satisfy some optimal behavior (Q, D, efficiency..). Such currents can be obtained by solving given eigenvalue problem in AToM. Hazdra, P., Capek, M., Masek, M., Lonsky, T, "On Antenna Parameters Inferable from Sources,'' Radioengineering (Feature Article), vol. 2016, no. 1, p. 12-17, April 2016.